That's where Ho Chi Minh is in Vietnam. 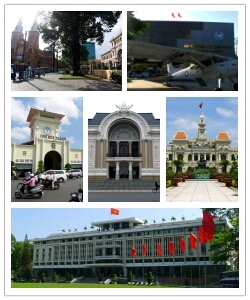 Hanoi is the capital city, which is up north. 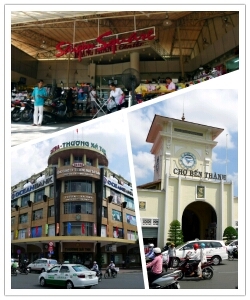 Ho Chi Minh City is an ideal place for traveling solo or for first time travelers. For me, there’s a nice balance of culture, history, picture-perfect landmarks, and delicious food. It’s also great how tourist spots are clumped together, making the city feel extra cozy. You won’t feel too lost if you lose your way. Despite its notion of being boring, you won’t feel lonesome in the city because of the numerous things to see and do. And depending on how you look at it, the language barrier is a fun challenge! It’s also here where all aspiring millionaires' dreams come true! With just $50 USD, you can boast of being a millionaire already—in Vietnamese Dong, that is. And the best part is that almost everything is affordable! Day 0: Arrival at Ho Chi Minh City, late PM. Check-in at hotel. I chose to do a walking tour of the city by myself. At some point, I got tired so I hired a motorcycle tour guide. Travelers can opt to join a tour group, which can be booked through the hotel. Most activities cited here were done on this day. The temple is home to Caodaism, a religion that mixes Buddhism, Protestantism, and Confucianism. We got there in time to watch the noon prayer session of Cao Dai followers. Afterwards, we headed towards the Cu Chi tunnels, which were used during the Vietnam war. The Holy See Temple (left), home to Caodaism. 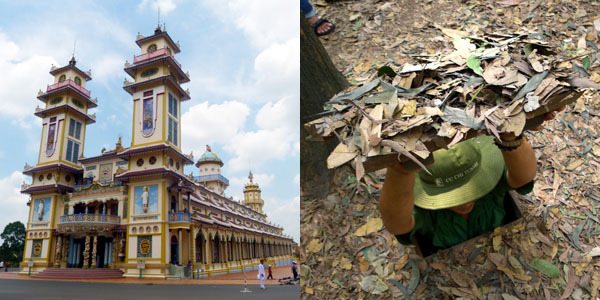 A hidden entrance leading to the Cu Chi tunnels (right). 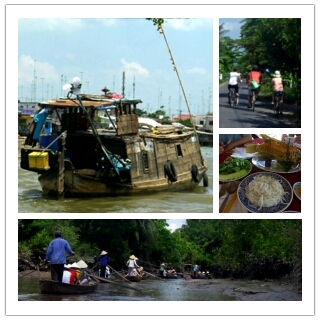 The highlights of the tour were riding a row boat along the shady canals, eating Elephant Ear Fish, and riding the bike along the village. Day 4: Shopping! Depart for Manila at night. Click here to download my detailed itinerary. This outlines everything I did, including costs and notes. Overall, I spent around Php16k, which includes airfare, accommodations and tours. This doesn't include shopping and souvenirs yet. Here's the map I used to get around the city. Major attractions are highlighted. Life saver! 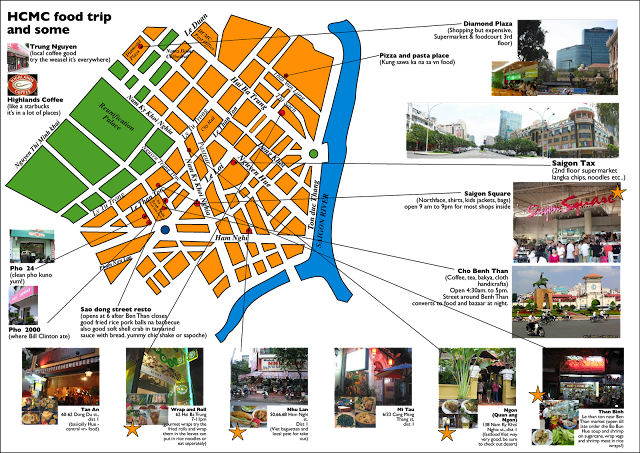 Map of Ho Chi Minh City! Click to enlarge! It's hi-res! Got this from the hotel. This also came in handy while planning my trip. Food and shopping guide! Click to enlarge. It's hi-res! Thanks, Zel! Click here for my food recos! Hope this helps! For any questions, please feel free to leave a comment. Hi Kei! Thanks so much! I also flew in at around 1am and arrived at the hotel at around 2am. My hotel was in one of those eskinitas, too. And you're right. Taxis can only drop you off at the eskinita entrance. You're on your own after that--not unless your driver is kind enough to help you find the hotel. Honestly, it can get pretty scary and confusing trying to navigate through the little streets--most especially if it's your first time and you aren't sure where exactly the hotel is. It doesn't help that the numbering system in the hotels are quite confusing. At least you have your aunt there. Hopefully it won't be that scary. In general, the eskinitas seem pretty safe. Good food is even served there! It's just pretty scary the first time when you're trying to find your way... and you have luggage with you. Hi henson! thank you for the reply.. that's what im wondering about, if kaya ba namin i navigate yung eskita..i will be copying most of your IT for HCMC except for the guesthouse lang i think..
can you suggest a good hotel na lang na near the street? I am just worried na baka my aunt would freak out sa paglalakad namin sa eskita with our luggages.lolz..
also, sir henson, can i get your email address so that i can send you my IT? i would like to ask for your opinion re our It. Unfortunately, I haven't tried staying in another hotel along the street. Though the good thing is that HCMC has an endless supply of hotels. Why don't you try booking through Agoda.com? You can find hotels that suits your budget, and you can check out the map to see if it's along the street. this rocks!! it is very helpful..
so among all those activities, what is it that highlights your trip, something that shouldn't be missed? The highlight of the trip was the Cu Chi Tunnel... and of course, eating street food! Hi Henson, This is indeed very helpful! An impromptu visit to Ho Chi Minh this month and I didn't know where to start! Btw, any recommended place around the city for arty farty stuff? like oil paintings and drawings? Your trip sounds exciting! There are lots of artsy fartsy stuff in the post office and even around the streets. I didnt see much oil paintings though--mostly art through paper cut outs or paper. There were also some stalls that sold mini figurines made of paper. Thank you for putting this up. Me and my hubby are planning to travel first week of September there. I think Ima just copy your itenirary.. haha! very helpful indeed. Go for it. Hope this helps. Good luck and have fun, Aaron! Hope you can share your Siem Reap itinerary soon. Hehe!